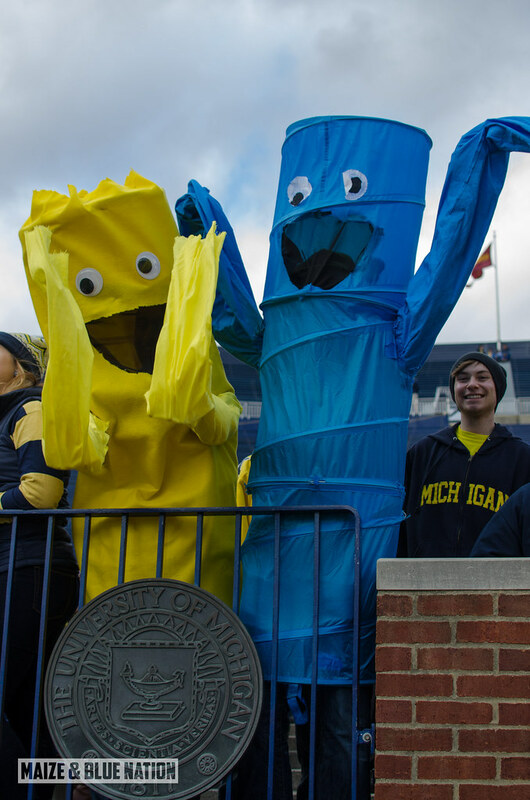 The University of Michigan Athletic Department and the Central Student Government announced Tuesday (March 11) a new and improved student ticketing policy for Wolverine football games. The new policy will feature an attendance-driven reserved seating plan that will assign students reserved season seat locations based on attendance points accumulated during the previous season. Seating will no longer be first-come, first-served general admission. Students can form reserved seating groups (maximum of 100 members). In 2014, groups will be seated based on average class level in the group, with the exception of SuperFan groups consisting of all returning students who attended at least five (5) games on time in 2013. These groups will be seated with priority group #1 in the lowest rows. Student season tickets prices will stay the same in 2014 at $295 (includes a $15 service charge). More details regarding 2014 student season tickets are being communicated later this week to returning students. The online renewal process will begin on Monday, March 17. Starting with the 2015 season, all reserved seat locations will be decided strictly by attendance points. Attendance points are accumulated for each game attended (3 points). Arriving 30 minutes prior to kickoff earn an additional three (3) points, for a total of six (6) points. There will be no class standing-based perks or points starting with the 2015 football season. A group’s standing (and seat location) will be calculated by an average group score from the previous year’s point total. Students can earn up to 36 points for the 2014 season, the equivalent of showing up to six (6) games at least 30 minutes prior to kickoff. Lochmann stated that the athletic department would only count six games instead of all seven, providing students with the benefit of the doubt for situations like holidays, student break, weather, etc., that can affect their attendance. This is all fine and dandy, but the major flaw with this is that it's based on a point system that rewards showing up early...which is typically not a problem for primetime games. But noon...or even afternoon kickoffs are a different animal. Also, let's not designate someone who showed up for 5 of the 7 home games last year as #SuperFans. How about just #AttentiveFans? I think SuperFans, I think face paint or yellow and blue tubes. This new plan seems like a compromise to try and make everyone happy. Goals? How about Michigan having a world-class football program and stadium...scheduling games against other schools...charging an admission fee well below market value...you buying a ticket and showing up in time for the game to start? How about not needing the athletic department to hold your hand as you walk to the stadium? MAKE THE STUDENT SECTION SMALLER! Simple economics. Increase demand by lowering supply. I digress. Look I get it, you can't make college kids just want to wake up to go a football game against a middle-of-the-pack B1G school at noon unless they really want to. Free will takes over when its 11AM, you're crazy hung over and it's raining. But that's not the athletic department's fault. Michigan tried general admission, and that flopped. Students eventually (for the most part) filled in their section, but usually not until well after the game began. From the student perspective, its a catch-22. Michigan has been mediocre the last couple years, and the schedule against the black and blue Big Ten hasn't done them any favors either. The dull 2014 home schedule starts with another visit from Appalachian State...which I can promise you no one is excited about attending. Michigan could help itself by scheduling sexier matchups and more exciting opponents to play at the Big House (not in Dallas). Scheduling more night games. And hoping like crazy that the Big Ten gets better at football. That would go a long way in rejuvenating student (and overall) fan interest.